recruitment on 30-04-2019 & 02-05-2019. These vacancies are fixed term contract basis. 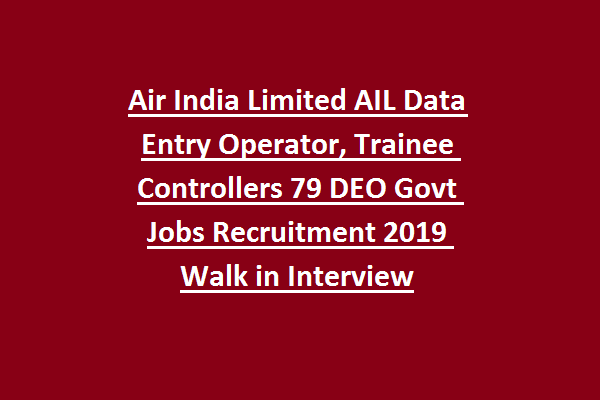 In this notification we are providing the age limits, qualification, walk in interview details and other related information of Air India Trainee Controllers, DEO jobs. Detailed information about this AIL Data Entry Operator vacancy details, category wise vacancies other details are updated below. There are total 79 posts in this AIL Data Entry Operator jobs recruitment 2019. Candidates selection will be based in work experience and interview. 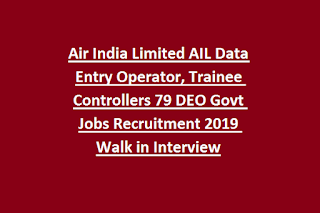 Attend walk in interview for this Air India Limited Recruitment of Trainee Controllers and DEO vacancies. Official website for this AIL Recruitment 2019 is http://www.airindia.in/.